Founder and President of H.G. Adams & Associates, Inc.; a Norfolk, VA based consulting company that provides human resources services and product to educational, governmental and industrial organizations. 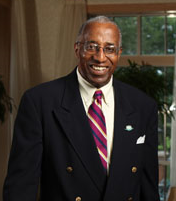 From 1978 to 1994, Adams served as Executive Director of the National Consortium for Graduate Degrees for Minorities in Engineering and Science, Inc. (GEM). Prior to joining GEM, Adams served as Vice President for Student Affairs at Norfolk State University. Adams is a leading expert on mentorship and internship programs and has written, lectured and consulted extensively on developing people in both academic and workplace settings. He is a sought after keynote speaker and seminar presenter, having spoken at over 500 colleges and universities and numerous national conferences and conducted training for a number of Fortune 500 companies. He is the author or coauthor of fifteen self-help guides and handbooks including: Negotiating the Graduate School Process: A Guide for Minority Students (1985); Focusing on the Campus Milieu: A Guide for Enhancing the Graduate School Climate (1993); Recruiting Graduate Students: Implementing the Key “R” of Recruiting (1998); Mastering the Ph.D. Process: Tips for Surviving and Excelling in a Doctoral Program (2002); The Internship Guide: A Blueprint for Successfully Managing the Internship Experience (2003); Networking; The Art of Meeting and Greeting People (2003) (co-authored); and The Undergraduate Research Experience: Examining Roles, Responsibilities, Strategies and Actions for Forming Effective Mentorship Alliances. In his 2002 book, Get Up With Something On Your Mind: Lessons for Navigating Life, Adams offers some essential advice for living a successful and productive life. In Family Wisdom (2006), he traces his ancestral family roots from the 1700s to the present. His latest book, Career Management 101: A Primer for Career and Life Goal Planning (2008), provides critical insight, skills, and tools for planning and managing one’s career and life. Adams holds a B.Sc. from Norfolk State University, M.S. from Virginia State University and Ph.D. from Syracuse University.